Knitting From Nothing, Rug By WWII Prisoner of War - craftivism. I get a lot of really great emails from people telling me about some of the absolutely brilliant things that people do. Yesterday was no exception when I discovered the story of Jim Simpson, who knitted a rug while a prisoner of war in Germany with unraveled garments, using pot handles as knitting needles. Click on the italic text to go to the respective news stories. And never forget the power and spirit invoked by embracing your creative spirit. Jim Simpson would have to be the toughest man to ever pick up a pair of knitting needles. The former prisoner of war, who spent more than 19 months in Germany’s World War II prison camps, not only survived interrogations and torture but managed to knit arguably Australia’s most valuable war artefact, outside a museum. 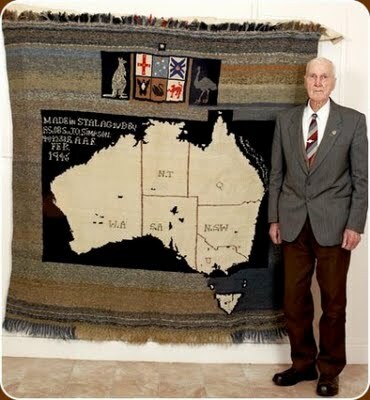 Jim’s rug is a perfectly preserved 1.83m x 1.9m knitted woollen blanket, featuring the map of Australia and the Coat of Arms. “I knitted it with straightened handles from the camp’s cooking pots; they looked like pieces of number eight wire,” Jim says. Jim credits his mum and his practical bushman’s upbringing in the Nariel Valley, near Corryong, for his knitting skills. “It’s one of those things, if you put your mind to it, you can do it. I could even turn the heel of a sock as a kid,” he says. At about this time I had gathered quite a few worn out pullovers, some lousy, some not. Boiling the garments for a few minutes kills the lice and their eggs, and it did not seem to hurt the wool very much. I knitted a few pairs of socks for some who were eager to escape, but they all seemed to return rather crestfallen, but; with socks intact. With this result I gathered enough wool, so I started teaching some of the lads to knit, about forty in all. They were really good lads, especially the R.A.F. boys. They were helpful in getting more old worn out pullovers to delouse, dismantle and roll into balls of wool of many colours. I had Red Cross Parcel boxes of balls of wool, especially the white wool, which was to be used in the White Map of Australia, which I had envisaged to be able to produce for the centre piece of my rug. The Jerries were very curious about these boxes of wool, but accepted my explanation for them. Oh, and once you’ve wrapped your head around this awesomeness, consider the fact that it took Jim six weeks to make the rug. Yes, arguably he had a lot of free time on his hands, but it’s still incredible nonetheless. And the next time you complain about not having what you need at hand to finish a project, remember that even in the toughest times, beauty can still find its way to you, with a little creativity, fierceness and love. Read more about Jim here, here and here. A Google quick search for him also turns up some interesting stories online via PDF. Jim’s rug is also profiled in The Knitted Rug by the wonderful and always inspiring Donna Druchunas. 8th Annual Supernaturale Holiday Hat & Scarf Drive! Thank you Jim for your service. I was a hidden child in Antwerp, Belgium during WWII and remember being liberated by the Americans. Your story is really an inspiration to all of us. this is incredible, i will forward to my friend india flint. it was flicked to me via facebook. much appreciation for bringin this to light. Thanks for linking to this. I’m teaching knitting to middle schoolers. The boys are fascinated, but were hesitant to try because of gender stereotypes. I can’t wait to share this article with them! Please keep sharing.